From the mythological Merman of the title poem, which won the 2010 Arvon International Poetry Award, to the imaginative “Fragments” and on to more serious poems such as “My Mother Ate Electricity” these are all engagingly written using the acoustic play of consonants and vowels so necessary for bringing life and music to the poems. Accessible and often strongly narrative they are always alert to the comic and everyday even when broaching hard subjects such as illness, mental illness and death. As always in O’Brien’s work, images of nature and landscape as well as relationships and a lively engagement with the ways of the world resonate with grace and candour. Jean O’Brien is a Dubliner now living in the Irish Midlands. 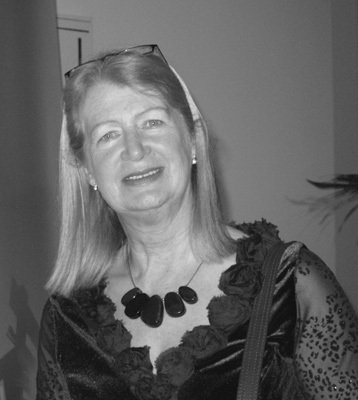 She has published three previous collections, The Shadow Keeper (Salmon, 1997), Dangerous Dresses (Bradshaw Books, 2005) and Lovely Legs (Salmon 2009). She has an M.Phil in Creative Writing from Trinity College, Dublin. She facilitates creative writing classes for a wide variety of organizations from the Irish Writers’ Centre, Dublin City Council and various County Council to Mountjoy, Limerick and the Midlands Prisons. She was Writer-in-Residence for Co. Laois. Her work is broadcast on RTE Radio, Sunday Miscellany and elsewhere. She did a collaboration with the artist Ray Murphy on an interpretation of her winning poem Merman which was held in The Arthouse, Stradbally. She was the 2008 recipient of the Fish International Poetry Award and in 2010 she won the biennial Arvon International Poetry Award. their night-dark hair is real and shines as if lit by stars. her off into the river of life, like the dolls of long ago. but now something more substantial, something lasting. we listen as leaves rustle in trees, and a tumult of traffic goes by. blossoms, brushes for the royal couples hair, oils and unguents. generous chest, she says I need to grow up soon, it’s urgent. machine, once everyone had one. she favoured the blue bobbin. were backed with blue stitches. into a small silver box. chamber to see if I could figure out its trick. the edge of a blue bobbin peeping out. 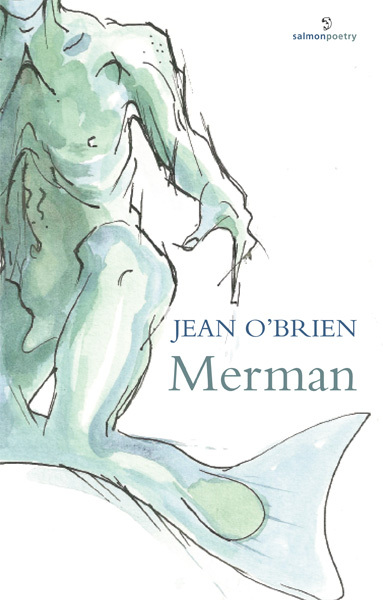 Merman opens with the obliquely powerful titular poem (an Arvon International Poetry Award winner 2010), justifiably described by the Poet Laureate as “wonderful”. Indeed, it is the outstanding poem in this excellent, multi-layered collection – O’Brien’s fourth. The cover representation of her post-Arvon collaboration with visual artist, Ray Murphy, weights that single poem still more. Yet it is the sole poem on that theme. No matter; there is much to be explored and only one other poem stands out strangely from this well-edited collection, and for very different reasons which I will come to it later. If there is nothing mythological in the wake of “Merman”, there is certainly Catholicism; its take on the underworld receives a witty slap in “Hell Reinstated”, “The Pope he knows he’s got the inside track”, whilst “Keeping Shtum” has a humourous childhood take on remembered Easter rites. That’s not quite true and also taken out of context. O’Brien casts memory very well – “the smell of summer/potted in a jar –” (“Summer Preserved”). Those evocative, visual (if sometimes incomprehensibly punctuated) pieces work: “[…] outside Greengages/ slowly ripen” and sits more easily alongside her lyrical recollections of the natural world in poems like “Rowing” and “Snow Ciphers”, where “Lambs hurtle like tossed snowballs”. Swim we call to her breathlessly. If O’Brien works most powerfully with those closest, she also includes a wide array of characters and influences. Anne Frank, William Carlos Williams, Rene Magritte, Adrienne Rich and more feature, and perhaps most surprisingly given that illustrious company, the daft Father Dougal in a salute to his unforgettable and unlearnable lesson (Small Cow, Far Away Cow Perspective). Wide-ranging indeed. O’Brien can slip into a sestina or a sonnet, turn shape poems, reference the Bible and popular television programmes, yet one poem, on page 19, sticks out like a thorn.There may well be moments in the private study of any contemporary Irish poet when that island’s extraordinarily rich poetic heritage cast as much shadow as light. “Brown trout”, “Lamping”, “Fossil Fuel”, poems of childhood, of Catholic tradition, death, water, foxes, weather, landscape …well, perhaps in the poet’s thoughts anything Irish really. O’Brien does have some reason to fear that someone might have been there already. However, if any poet feels inclined to indulge in versified shillelagh rattling at major names and at their supposed hinterland, then the poem fashioned for that purpose must be an incredibly fine piece of blackthorn. And Paul Muldoon possibly never laughed at Father Ted, but then nor did he write the brave “Fragments”. Jean O’Brien did and she should be proud. Next time, just leave out “Dear Reader Seamus Heaney Doesn’t Own Them”. We know.